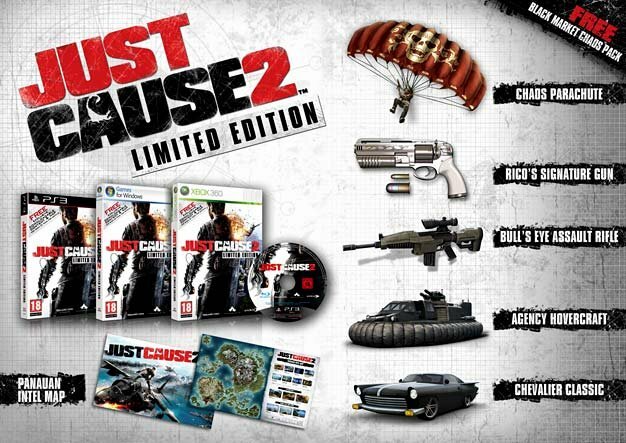 Square Enix has announced a UK-bound Limited Edition of the recently dated Just Cause 2 which will pack an intel map marking a number of hot spots and some extra in-game vehicles and weapons. The vehicles and weapons will be available in downloadable form and will be available to North American gamers as well, though not as part of a Limited Edition. Instead, the content will be available to those who pre-order the game starting today. All the item details follow. For a bigger version of the image above, check the gallery. Agency Hovercraft: The ultimate in amphibious transport, the Agency Hovercraft is the most flexible form of transport in the game. Equipped with a turret-mounted grenade launcher, you’re guaranteed to blow your opposition out of the water. Rico’s Signature Gun: Customised by the Agency and adapted for Rico’s shooting style, this deadly accurate and powerful pistol has precision, power and flair. Bull’s Eye Assault Rifle: More powerful than the standard assault rifle, this lightweight and lethal automatic rifle features increased accuracy and a higher magnification scope. Chevalier Classic: No agent should be without a hot set of wheels and with an increased top speed and superior handling, you can arrive at your destination in style or make a guaranteed quick getaway. Chaos Parachute: Featuring a skull motif, make an entrance no one will forget … should you leave anyone alive to remember. Panauan Intel map: With over 1000km² of tropical paradise to explore, the included fold-out Panauan Intel Map is an ideal reference tool for navigating around Panau, marking faction leader HQs, recommended BASE jump peaks and much more.